The dollar edged lower against major currencies and global stocks were on the defensive on Monday as a "Trumpflation"-fueled rally paused and political risks came to the fore in Europe. U.S. Treasury yields, which have risen since Republican Donald Trump won the U.S. presidential election on a platform seen likely to raise U.S. growth and inflation and lead to higher interest rates, fell from 2016 highs hit on Friday. The dollar fell 0.3 percent against a basket of six peers but still held close to its highest levels since early 2003. The Japanese yen rose 0.3 percent to as high as 110.51 per dollar, having earlier fallen to 111.19 yen, its weakest since early June. The euro rose 0.5 percent to $1.0649, with analysts saying the move reflected the abundant political risks facing Europe over the coming year. A surprisingly strong showing by conservative former premier Francois Fillon in a weekend French presidential primary was expected to heighten uncertainty. Some suggested that his unpopularity among left-wing voters could raise far-right, anti-euro leader Marine Le Pen's chance of victory in an election to be held in April and May. However, German Chancellor Angela Merkel's announcement on Sunday that she would seek a fourth term in next September's election removed another source of political uncertainty, which has intensified since Britain's vote in June to leave the European Union and Trump's election on Nov. 8. Yields on lower-rated euro zone government bonds rose while those on German benchmarks edged lower. In Italy, which faces a referendum on which Prime Minister Matteo Renzi has staked his job, 10-year yields rose 2.4 basis points to 2.05 percent, while German equivalents dipped 0.3 bps to 0.28 percent. "Indirectly, the French primary vote could reinforce concern about an anti-establishment backlash in Europe," said Martin Van Vliet, senior rates strategist at ING. "Even if the sell-off in core bonds is fading, we still see pressure on the periphery." 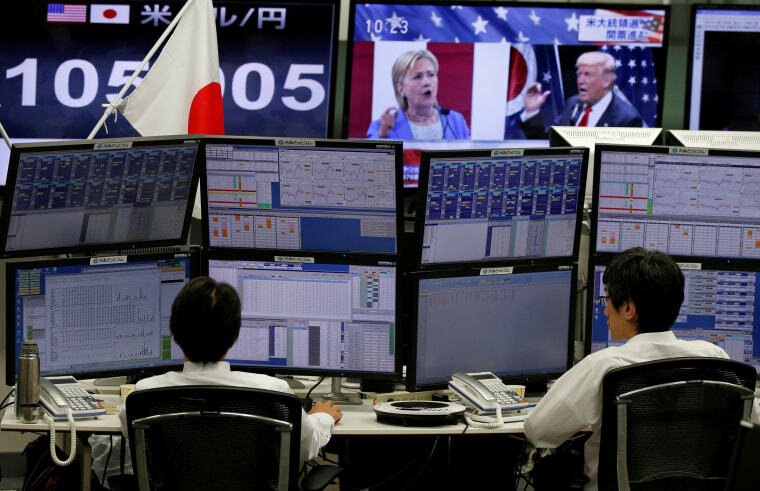 "The markets driven by Trump may be just about to have run their course for now," said Toru Ohara, chief investment officer at Okasan Asset Management. "A rise in interest rates is, generally speaking, not good thing for stocks, especially for emerging markets. But if you think that U.S. bond yields, which have been falling since 1982, may be bottoming out, that could mean the end of a low-growth/low-inflation regime," he said.